I love April. I’ve long said it’s the prettiest month of the year with all the new growth turning the world a vibrant green. You can actually eat a lot of the these lovely greens in the hedgerows; they are amazingly good for you, they taste like other greens and take very little effort. For years, I avoided eating nettles thinking it was just too much hassle. But I’ve discovered that in spring it’s actually easier and way more fun than buying greens from the supermarket. Today’s delicious lunch was foraged from my wild garden and chicken coop and took less than 20 minutes to collect, prep cook and eat. Foraging for dinner is a great family activity. It’s wonderful for kids to be able to provide the ingredients for dinner for everyone. Following on from yesterday’s weed appreciation day, below are three weed based recipes. 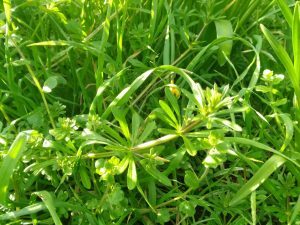 Spring is when many weeds, especially goose grass and nettles are at their tastiest, the new shoots are less bitter and stringy than they are by summer and dandelions are in their full glory. Some weeds are also incredibly good for you, a free superfood you might say. 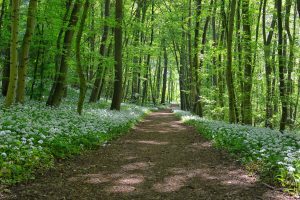 I’ve deliberately steered clear of edible weeds like Cow Parsley in the umbellifer family as they can be confused with the deadly hemlock and poisonous Fools Parsley. It’s just not worth the risk. It’s name means lion’s tooth. Probably derived from the jagged leaf. 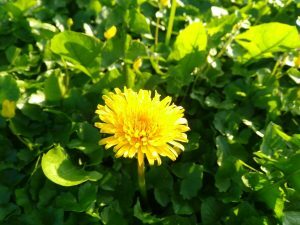 Dandelion leaves bitter taste and inulin content aids digestion. You can use the petals as garnish. Warning: the juice from the stems permanently stains. 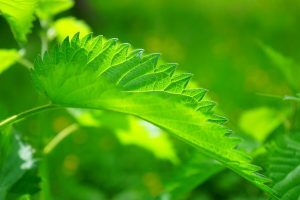 Despite being best known for their sting nettles are actually a superfood. 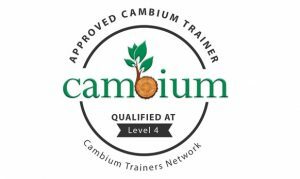 They contain the highest plant source of iron, as well as all the amino acids vitamin A, C & K and some B vitamins. Pick them before they flower and become fibrous and always use gloves when harvesting and preparing. The sting is removed by cooking. As well as providing hours of entertainment this sticky plant is actually a wonderful cleansing tonic. Pick before the seeds form and it gets tough. Later on in the year you can dry the seeds and use as a substitute for coffee. It’s latin name means star in the mist, a beautiful description of the star shaped flower in the tangle of leave. 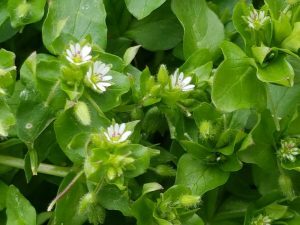 Chickweed leaves and flowers are tasty, full of B complex vitamins, iron, calcium, and vitamins A and C. It also soothes inflammation. You can eat the leaves raw and the leaves and stems cooked. It can be added to any of the recipes above. 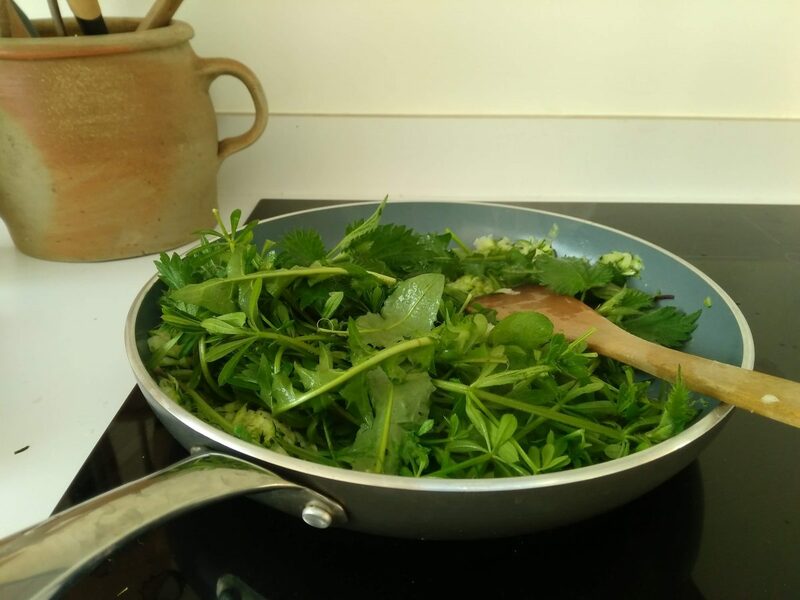 Also known as ransoms, it’s leaves will give a mild garlic flavour to any of the recipes above. Found in shady woodlands you’ll be able to smell it. Folklore says it will even keep vampires away! Be careful when foraging for wild garlic not to pull up the bulb so it can come again next year. When foraging and preparing nettles, wear gloves. Don’t pick from the side of busy roads or any where that may have been sprayed with herbicides or pesticides. Try to pick in places at height dogs are less likely to have urinated at. Wear old clothes. My sons t -shirts are covered in little brown circles that don’t wash out from his enthusiastic dandelion harvesting. These are so quick and easy and delicious to do on a campfire and it’s a great way to combine dandelions, goose grass and nettles in a delicious meal. You don’t need to be too precise about quantities either. I chose this as it is an excellent reason to build a clay oven in your forest school setting. It is so nice to make and eat outside and great for the children to see that there are positives to nettles. Nettles also contain the highest plant source of iron, they really are a superfood.